BONN, GERMANY (31 JAN 2013)—Concerned that inconsistent funding eventually could weaken a global network of seed banks at a time when farmers face unprecedented challenges, two of the world’s leading agriculture organizations announced today a bold new effort to secure what many consider the foundation of food security in the developing world. The agreement between the Global Crop Diversity Trust and the CGIAR Consortium provides US$109 million over five years for the CGIAR Research Program for Managing and Sustaining Crop Collections, which is dedicated to maintaining the 706,000 samples of crop, forage and agroforestry resources held in “genebanks” at 11 CGIAR research centers around the world. 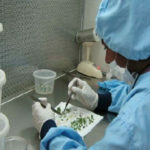 Beyond maintaining the vitality of the existing collections, the CGIAR Consortium partnership with the Trust envisions adding some 56,000 new samples or “accessions” to the genebanks by 2015, including a large number of wild relatives of cultivated crops. Wild relatives often contain important traits, such as drought tolerance or disease resistance that can be hard to find in cultivated varieties. New plant breeding technologies are making it easier to borrow traits from distant wild relatives and use them to improve the productivity or fitness of a cultivated crop. The new partnership between the Trust and the CGIAR Consortium will allocate the US$109 million over the next five years to fund crop preservation and collection work at the CGIAR genebanks and ensure their crop samples are still widely shared. During that time, the CGIAR Consortium and the Trust will work with donors to secure a more permanent endowment to fund the genebanks in perpetuity. 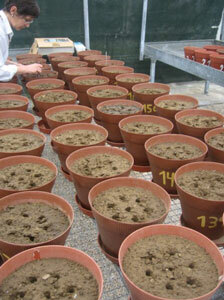 The mission of the Trust is to ensure the conservation and availability of crop diversity for food security worldwide. Although crop diversity is fundamental to fighting hunger and to the very future of agriculture, funding is unreliable and diversity is being lost. The Trust is the only organization working worldwide to solve this problem. The Trust is providing support for the ongoing operations of the seed vault, as well as organizing and funding the preparation and shipment of seeds from developing countries to the facility. CGIAR is a global partnership that unites organizations engaged in research for a food secure future. CGIAR research is dedicated to reducing rural poverty, increasing food security, improving human health and nutrition, and ensuring more sustainable management of natural resources. It is carried out by the 15 Centers, which are members of the CGIAR Consortium, in close collaboration with hundreds of partner organizations, including national and regional research institutes, civil society organizations, academia and the private sector.